Animals will often enter the strangest places. If it is dark and inviting, they will move right in and set up housekeeping. With multiple vents on a home or business, there are many advantageous places where an animal can gain access to a structure and begin breeding. 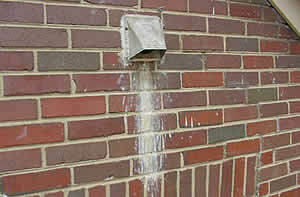 Dryer and bath vents are commonly used by birds and squirrels for nests. They will pack their nesting material in the vent and raise their young right in the piping. All vents must be kept free flowing to allow proper function but they need to be protected with a secure cover to keep wildlife from invading. There are many styles of covers available that will protect the wide range of shapes and sizes of vents and chimney flues. We use only the best quality chimney and vent covers and provide a warranty on every one we install. If you are faced with a wildlife infestation of your vent or chimney, contact the Wildlife Control Professionals at A All Animal Control for assistance today with animal and bird nest removal from dryer, bath, stove vents and chimneys.